The first symptom which indicates that Windows 7 build 6956 (HTTP download link) is indeed a ‘real’ Windows 7 (be it a real beta or not) and not a ‘Windows Vista upgrade’ is that the hack to use Windows Vista beta product key to activate Windows 7 pre-beta no longer works. No activation crack for W7 build 6956 is been developed yet, but it’s not really required too, as when the official beta for Windows 7 is launched, participants will get free beta product key to activate the beta build of Win7. The public beta of Windows 7 is widely speculated to be released on early 2009, probably on January or February 2009. As such, even without any activation crack or working product key to activate Windows 7 build 6956, users can simply rearm Windows 7 build 6956 installation when the activation grace period is about to expire in order to extend the free usage evaluation period for a further 30 days, and hence does not need to activate Windows 7 build 6956 for yet another 30 days. Users are allowed to perform rearm operation for up to 3 times. Thus, users can run the rearm command to extend activation grace period for up to 120 days or 4 months, if they do it at the very last day of grace period expiry, enough to wait for beta program for Windows 7 to be launched. 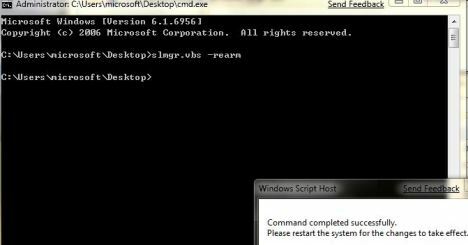 For how to rearm, see the tutorial guide to rearm Windows 7.